In what may have been (for the time) the boldest examination of American exceptionalism and “xenophobia” (though I hate to bandy that term in the wake of overuse), The Man Who Knew Too Much provides thrills and agonizing suspense. Indiana tourists in Marrakesh witness the murder of an new acquaintance. Before the man expires, he imparts information about a planned assassination of a statesman in London to wide-eyed patriarch James Stewart. In order to keep this revelation a secret, double agents disguised as a British husband and wife abduct Stewart’s (and wife Doris Day’s) young son, Hank. Fearing reprisal, Jimmy and Doris take it upon themselves to rescue their son without the aid of local authorities. They keep mum on the assassination plot, travel to London (where former singer Day is given a hero’s welcome), and follow up on clues given to Stewart by the dead man. In an amusing twist, Ambrose Chapel is revealed not to be a person, but a place. Stewart causes havoc on the namesake taxidermist, and it takes a while before he can clear up that misunderstanding. Notice how briskly this plot unfolds? We’re in Marrakesh for a little while, and then we’re in England. Stewart and Day next meet up at the chapel where Hank is being held. The assassination will occur at the clash of symbols during the allegro agitato’s climax of Arthur Benjamin’s Storm Clouds Cantata at the Royal Albert Hall during a performance for the visiting Prime Minister. The Prime Minister is to be the target. Doris Day lets out a blood-curdling scream that distracts the would-be killer and alerts the audience to the situation. Later, she uses her showcase song, “Que Sera, Sera (Whatever Will Be, Will Be)” (introduced in this movie), to let Hank know she and his father are nearby. Jimmy and Doris find themselves to be reluctant heroes in a story of political intrigue, and that’s what makes The Man Who Knew Too Much an incredibly fun movie to watch. What is most intriguing about The Man Who Knew Too Much are the unusual character motivations at play. Even before the thrills begin, Doris Day’s character is revealed to be paranoid (she’s always commenting on curious onlookers) and somewhat insecure in her decision to marry a doctor, though she does want to have another baby. Jimmy Stewart’s character seems to have little patience or respect for cultures and practices outside of his perceived friendly and familiar American traditions (his adventure in a Marrakesh restaurant is particular cringe-worthy). British and Moroccan law enforcement is portrayed as downright lackadaisical, inefficient, and incompetent. Between the years 1954 and 1956, Alfred Hitchcock made two movies per year; an incredible body of work from Dial M for Murder to The Wrong Man. After this highly energetic, creative period, he would begin to slow, averaging one movie every year until 1960’s Psycho (his most commercially-successful film) and the resulting cloud of notoriety that would dog his steps until his death in 1980. Because of Psycho, Hitchcock’s name would become synonymous with psychological horror and shock. He attempted to revise his legacy with an old-fashioned monster movie in The Birds (1963), and another case study of neurosis with Marnie (1964) before returning to political intrigue and espionage with Torn Curtain and Topaz, but none of these films would equal the financial and critical success of Psycho. In a way, he was consumed by his own success. That about does it for Alfred Hitchcock month. The five “missing Hitchcocks” were re-released to theaters starting in October of 1983. The next year, the movies made their premieres on cable television as part of a Hitchcock retrospective on The Movie Channel. This was my Hitchcock education for a time until home media increased his popularity even more. For more fun stuff about Hitchcock, check out the “Missing Hitchcocks” episode of my podcast, Two Davids Walk Into A Bar, as well as David & David and Gene & Roger: A Siskel & Ebert Podcast. Young Jerry Mathers hears gunshots and arguing in the idyllic Vermont countryside. He stumbles across a dead body. It’s a body everybody seems to know, with the exception of the strange artist Sam Marlow (John Forsythe). Along the way, he picks up various tid-bits, little nuggets of information with regard to the owner of the dead body, a disreputable sleaze from Boston named Harry. Introducing the cuddly, fiercely intellectual Edmund Gwenn, hunting for rabbits, mistakenly believes he has shot Harry dead when he comes across him. Along the way, he makes a date with neighbor Mildred Natwick for some blueberry muffins and elderberry wine. Jerry runs home to tell his mom (cute Shirley MacLaine), and before Edmund can dispose of the body, they’re up to see Harry. Shirley seems awfully happy Harry has bitten the dust, as it were. Edmund can’t seem to get any work done, because the entire town trapses through; among them, an absent-minded doctor who trips over him, and a drifter who steals the dead man’s shoes. Enter the handsome Sam, who barters his art for supplies and food at the general store. Nosy sheriff Calvin Wiggs (Royal Dano) aims to level a fine at whomever he catches shooting off guns on his “posted” land. You get the feeling this is a small town, because everybody knows everybody. The Trouble with Harry is an unusual film, even for Alfred Hitchcock. He (and his writer John Michael Hayes) make sure not to make enemies of his leads, even the shifty Wiggs. It’s almost a slice-of-life about small-town folk who get to know each other in a more intimate way as a result of a body being dropped in their collective lap. Out sketching later, Forsythe comes across the body. Being an annoying artist-type, he sketches the body. Edmund confesses to the crime he possibly couldn’t commit, whereas Forsythe speculates Harry was destined to die at this particular place, at this particular time, and that Edmund did the Universe a favor. When we’re having discussions about existentialism, we’re not especially interested in a murder-mystery. The Trouble with Harry is a black comedy. Forsythe makes an agreement with Edmund that they’ll dispose of the body if they can prove Shirley’s innocence in the matter. To that end, Forsythe gets chummy with her. They have a mutual attraction for one another, as much as she tries to dissuade his interest. She’s not good with men. That won’t stop Sam. He loves her and he loves her son. They have a strange, flirtatious first encounter. I wonder if this movie would be a good companion piece with Rope; wherein we have characters debating treacherous action under the guise of intellectualism. Where Rope was more in the vein of melodrama, this movie is played strictly for uncomfortable laughter. Negotiating Shirley’s scatter-brained take on her relationship with Harry, Forsythe (probably against his better judgement) courts her, and bands together Natwick and Edmund to create a more appropriate death scenario for Harry so that no one will face criminal repercussion. It complicates matters when each character takes it upon themselves to conceal Harry’s body without telling anyone else their plans. Along the way, love stories develop; one young and one old, and these are very charming entanglements. If a less experienced, perhaps younger filmmaker were to tackle The Trouble with Harry, he would, almost certainly, be accused of not understanding the value of tone in storytelling. In the hands of a grand experimenter, The Trouble with Harry is great fun and makes perfect sense. Two Davids Walk Into A Bar presents a very special episode devoted to the five “missing” Alfred Hitchcock films re-released to theaters in 1983, and on home media in 1984 and 1985: Rear Window, Vertigo, The Trouble With Harry, Rope, and The Man Who Knew Too Much. On occasion, you would have dual premieres of movies. HBO and Cinemax, at the time, aired new releases on the same night, usually a Saturday. One such summer Saturday, HBO debuted National Lampoon’s Vacation and Cinemax aired Psycho II. We couldn’t decide what we wanted to watch, and back in those days, you couldn’t Tivo your troubles away, so we went with Psycho II. I had not seen the original Psycho but was well aware of the famous shower scene. It would be a couple of weeks later that I finally watched the original Psycho, and to this day, nothing scares me more than Mrs. Bates. That goes for Michael Meyers, Charles Manson, and Donald Trump. I repeat: nothing scares me more than Mrs. Bates! I remember a few years ago, somebody made the point (maybe it was me) that Norman Bates never truly existed; that whatever Norman was, only appeared to be an extension of his mother, the famous Mrs. Bates. When you look at Norman, even in advanced years, played by the extraordinary Anthony Perkins, he’s nothing more than a “man-child”, consumed in fear of disappointing his mother and telegraphing an all-consuming shyness around women he deems attractive, women he is driven to be attracted to – starting in 1960’s Psycho with Janet Leigh’s Marion Crane. Norman’s mother had gained a peculiar form of immortality by being so endemic an image in her son’s mind that she devoured him whole and implanted her own personality. It has taken 22 years for Norman to become his own man, and sadly, there are those who still wish to destroy him. Once released from the custody of the State, Norman tries to pick up the shattered remains of his life and run his motel. He fires sleazy manager Mr. Toomey (a hilarious Dennis Franz) and makes a new friend in Meg Tilly. Of course, all of this is a veneer; a curious effort to drive Bates mad so that he will be taken away again. Meg Tilly is the niece of Marion Crane and she and Crane’s sister (a shrill Vera Miles) take turns phoning Norman and dressing up as his mother to make him crazy. Meanwhile, very real murders are being conducted by a mysterious third party, who is revealed at film’s conclusion. As with the original Psycho, you can’t help but feel for Norman as his mask of sanity slips away gradually. Meg Tilly (at first) sides with her mother in discrediting Norman, but as she sees the struggles he tries to cope with, she develops an affection and attraction to him, ultimately protecting him from her mother’s cruel scheming. Anthony Perkins’ promising career was destroyed by Psycho. He was forever type-cast, as either yet another psychotic personality, or a borderline “heavy” in most movies after Psycho. 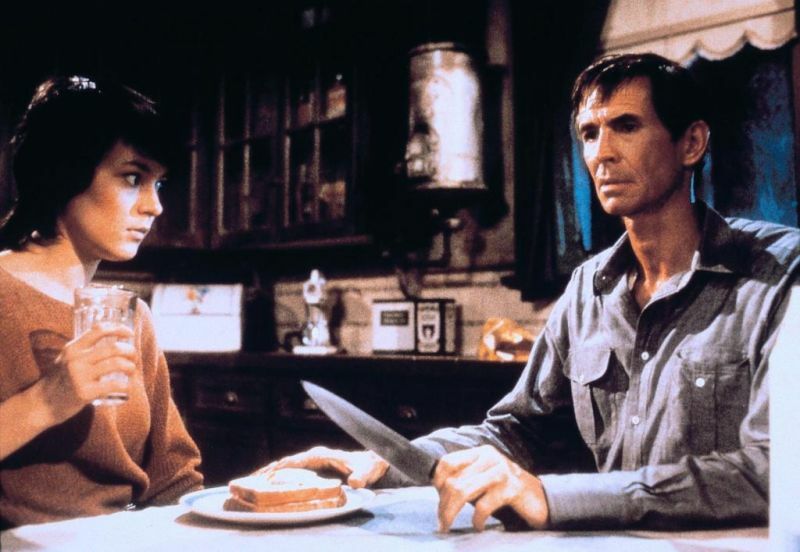 Like Leonard Nimoy before him, he decided to wholeheartedly embrace his legacy by directing 1986’s Psycho III and appearing in the promising, but ultimately illogical Psycho IV. Richard Franklin does an admirable job directing this first sequel to the horror classic, and having to weather the storms of vicious film critics, who bemoaned a lack of originality in Hollywood they perceived had to rely more and more on sequels to make easy money. 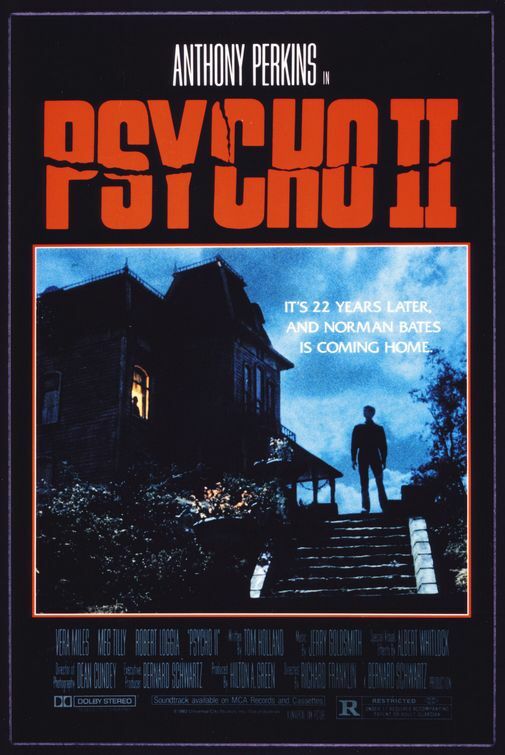 As we know, this was only the beginning, but Psycho II is a well-crafted, labyrinthine thriller with elements of mystery and suspense worthy of Alfred Hitchcock. Tom Holland’s script is intelligent, sympathetic, and thought-provoking.